The question on everyone’s mind the past few days seems to be: Is the new iPad hot or not? We don’t mean “hot” in the sense of popularity—3 million iPads sold during the opening weekend of sales would seem to settle that issue. No, we’re referring to the heated discussion in the Macworld forums and elsewhere about whether or not the new iPad runs warmer than the iPad 2. 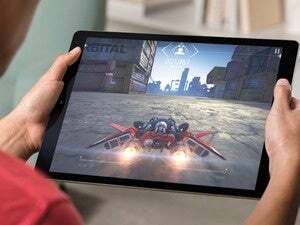 Consumer Reports waded into the issue on Tuesday with its claim that the surfaces of new iPad can reach 116 degrees when running some games. (That’s certainly a headline-grabbing result; Consumer Reports’ conclusion that the new iPad “felt very warm but not especially uncomfortable if held for a brief period” was buried deep in the story and got less play in the press.) Apple, for its part, said the tablet operates “well within our thermal specifications” and invited customers with any concerns to contact AppleCare. At Macworld Lab, we’ve got a third-generation iPad and a handy Raytech Raynger ST infrared thermometer close at hand. Why not do some testing to check the numbers behind the chit chat? The new iPad does indeed run hotter than the iPad 2, but not intolerably so. To test temperatures, we let the new iPad and the iPad 2 warm up by running a series of tests using GL Benchmark 2.1.2 for about 20 minutes. Using the handheld IR thermometer, the hottest spot we could find on the new iPad was 99 degrees. The area that hit that mark was on the back, along the long edge opposite the camera. The edge with the camera read 89 degrees. Running the same test on the iPad 2 the hottest reading I saw was 87 degrees, in the same spot. The edge with the camera read around 83 degrees on the iPad 2. That’s a higher temperature on the new iPad, to be sure, but not the sort of thing that’s going to make you drop your tablet howling like Major Toht when he tries to grab the fire-heated amulet in Raiders of the Lost Ark. Just for comparison’s sake, I also took some readings on my mid-2010 15-inch MacBook Pro. In those tests, the MacBook Pro’s temps peaked at 110 degrees while running Cinebench, with the hottest spot being on the bottom, about an inch away from where the screen connects to the body. In the less exacting “lap comfort” test, the new iPad is noticeably warmer than its predecessor, but it’s not at all uncomfortable when using it in the controlled climes of the Macworld Lab. If the underside of the iPad ever did get too warm for my liking, simply turning the tablet so its camera edge was closer to my body would probably lower my lap temperature. The MacBook Pro, on the other hand, felt like I was having my clothes pressed while wearing them. Updated at 11:25 p.m. PT with a more basic table illustrating the lab’s findings.